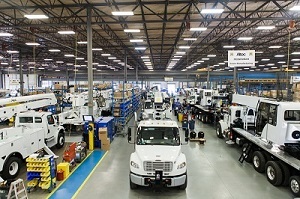 Thank you to our 2018 Spring Seminar host, Altec Inc. for its generous support of our programming and tour of Altec’s incredible facility in Elizabethtown, Kentucky! At the beginning of the tour, we were greeted by Jon Styslinger, President, Altec Inc. He provided us with a unique history on this family-owned business. As he walked the floor during our tour, you could see the mutual respect and appreciation between him and Altec’s 1,000+ employees. DID YOU KNOW Altec will customize your order? It’s all manufactured onsite from raw material, to painting, to assembly. While 90 percent of orders are for Altec white, if you want a pink truck, they will give you a pink truck! AND, ALTEC INC. IS PROUDLY MADE IN AMERICA! Altec Inc. was invited to help represent the outstanding manufacturers throughout the country at the ‘Made in America’ product showcase at the White House on July 21, 2017, which highlighted a U.S.-made product from each of the 50 states. Altec was one of the featured manufacturers at the event, showcasing an Altec AN67 Aerial Device at the front entrance to the White House. And thank you to our Learning Labs for their contribution to another successful Spring Seminar! Scroll down to the Handouts tab to view their presentations. 2019 Spring Seminar planning is well underway! Visit www.nalmco.org often and watch your emails and publications for more information. We asked: Did Spring Seminar change what you know, what you do or how you do it? Yes I always attend the classes so that I learn the terminology and newest products to enhance my knowledge when speaking one on one. Yes. Gained more education about Controls. Built network through social interaction. Attendees earned 12 hours toward recertification of their NALMCO certifications. Questions? Contact Denise Hoffman meetings@nalmco.org or (515) 334-1049.